Extra thick welded PVC frame and vent insert. Multiple wall widths for installation in poured and concrete block construction. 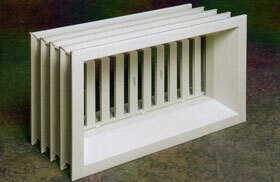 Vent easily opens and closes from exterior providing ventilation in any season. Mesh screen protects against unwanted animals and debris. Overall "Perma-Buk" frame size is 19-3/9" wide x 11-1/8" high. Vent size is 16x8"